While they are not the first, and they surely won’t be the last, the Samsung Galaxy Gear has been announced amidst all the excitement this week. There were a lot of rumours and leaks, and I have to say that Samsung have come out as winners at the end. No, I don’t think will be the device that causes the revolution they are hoping for, but it is a step in the right direction. Much like the first iPhone was, well, for me at least, a disappointment. But the next one was better. And the next. And then others learnt from it. Android happened. And look where we are now. People who would actively make fun of the smart phone carriers now have one in their pockets of handbags. This isn’t the first smart watch in the market. In fact, it isn’t even the first smart watch in the recent few months. Sony went ahead and announced their Sony Smartwatch 2 back in July (https://www.oxgadgets.com/2013/06/sonys-smartwatch-2.html). Then there are the likes of Pebble, which work on a very similar principle, though don’t quite work on the Android Platform. Of course, Qualcomm have also gone and announced the TOQ, so the market is starting to look very interesting. We must not forget though, that a lot of other smart watches exist, such as the ones fitness and sports enthusiasts wear, that map your runs, give you your caloric burn rate, and the sort. Also, we have seen the likes of Databank and what not. The only problem is that while historically they have all been exciting and popular, they haven’t quite found their way in every home and wrist. Main reason being that they have either been expensive, or just been too difficult to use. The idea is simple. To keep it simple. If you make it easy to use, people will use it, and buy it. That is what worked so well for the iPhone, and while we haven’t had a play with the Galaxy Gear, based on what we see, it seems to offer a simple enough solution. But so does the Toq, and how the market behaves to these two would be quite interesting. Obviously, price is another factor, and while the likes of Pebble are just above the £100 mark, the Galaxy Gear is 3 times that, which does make you think twice about buying one. “Samsung’s ongoing smart device innovation leadership reflects our commitment to listen to our consumers who want their daily lives to be easier and more enjoyable. Samsung Galaxy Gear benefits consumers by integrating smart device technology even deeper into their everyday lives, and bridges the gap between the mobile device and fashion worlds to create truly wearable technology,” said JK Shin, CEO and President of IT & Mobile Division, Samsung Electronics. 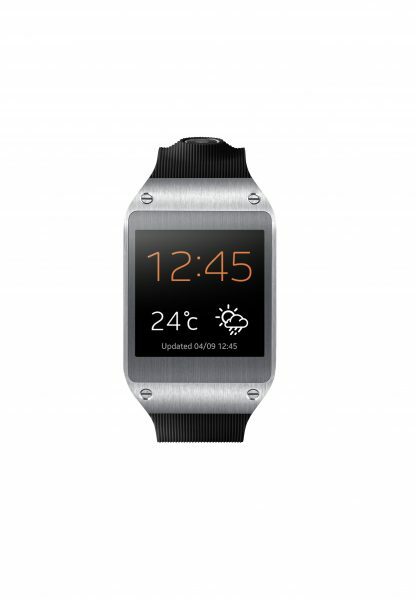 “Samsung Galaxy Gear frees users from the need to constantly check their smart devices while maintaining connections. It provides what we call ‘smart freedom’ by allowing users to choose how, why, when and where they are connected”. The best part of getting a Smartwatch from the likes of Samsung is that it comes preloaded with featured apps. There are apps that are all designed for the Galaxy Gear screen, who use the hardware to its best potential, and help you work out, share location, take pictures, find out the best price of what you are buying, or just tells you all about the win you are about to have. This is probably what will make and break the sale of this watch! So, what do we have to say about all this? Like I said above, this is definitely a step in the right direction. It looks a bit chunky, and that will go against it. Hate to say this, but all eyes on Apple now. The specific apps designed for this will do wonders, and that is where it is all focused. The price point is quite high. I am hoping it would come down as more watches appear in the market. The addition of a camera is brilliant. Not only does it allow you to take pictures on the whim, it actually lets you scan items like your wine to get all the information. Get ready for a whole new level of food photos! The ability to raise this to your ear to make phone calls is quite interesting. It is something that we’d be quite keen to try out. Mainly because other watches have packed in speakerphones, and that just means you can’t really have a call in public. Giving it voice commands, while a cool feature, is probably not that useful, once again, in public. However, both of the above could prove quite useful when driving. Obviously, rather have both hands on the wheel. One thing that I personally don’t like is that you can’t see the time without actually pressing a button, or accessing something. That takes away the very essence of a watch, where you can just glance to look at the time. So yeah, that is what we think.Do tell us what you think! TripIt from Concur makes it easy to organise travel plans in one place. Safety assistance: In case of emergency, press a power button 3 times continuously, and then user’s location information is transferred to the saved contacts with message.